Sierra Leone’s octogenarian political icon, Dr. John Karefa-Smart , died this evening at 8: 25 pm in Freetown . The Permanent Mission of Sierra Leone to the UN was immediately informed after one of the greatest sons of the land breathed his last . Dr. Karefa-Smart was living in the U.S .until a few weeks ago when after previously becoming gravely ill , he was admitted at a hospice in Connecticut, from where he was taken to Freetown . He was diagnosed with a medical condition that gave him only a single month to live and family members and President Ernest Bai Koroma honoured the late man’s wishes to enter his twilight hours in his motherland. The Permanent Representative to the United Nations , Mr. Shekou Toure, went to Connecticut with a delegation from the Sierra Leone Mission to visit the the veteran politician at his sick bed at which time he was said to have become so rejuvenated by the visit that , though he had been very weak and silent, he developed some amazing strength and gave what the delegation described as a very enlightening and educative political discourse during which the old political warhorse narrated his long , colorful and often controversial political history. He became his old confident self and even joked that he and his wife will be attending Sierra Leone’s 50th Independence Anniversary celebrations in Freetown next April. 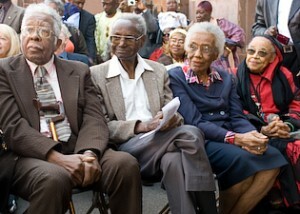 John Karefa-Smart (center-left in photo) sat with his wife Rena Karefa-Smart (center-right) and two friends, Arthur Pulley (left) and Bernice Cosey Pulley (right). Dr. Karefa-Smart was flown to Sierra Leone at the tail end of July , with President Koroma ensuring that he was given a special residential quarters and a VIP treatment . He remained his optimistic self until he went to be with his ancestors this evening. We will bring you full details of funeral arrangements soon.